Redundant Array of Inexpensive Disks (RAID), RAID arrays are used to speed up disks access time, and to get better storage reliability and modern day motherboard’s make setting up an RAID Array easy,but the problem comes when you have to more your RAID Array over to another system because you lose RAID compatibility once you switch your motherboard vendor. Raid2Raid by DiskInternals is a free universal RAID adaptor that lets you change your RAID Array over to a new motherboard of a different vendor, without loosing the RAID Array.Raid 2 Raid will re-assemble the array and mount it as a single drive letter. Even if your new motherboard lacks hardware RAID capabilities. Raid 2 Raid Supports Intel, nVidia, and VIA chipsets and all types of RAID arrays, including JBod (RAID 0), Stripe (RAID 0), Mirror (RAID 1), RAID 5 (complete data recovery is possible if any disk is missing from the setup), and RAID 0+1 (RAID 10). It supports file formats from Windows 2000 (Dynamic Disks) to Windows 2008, including FAT, NTFS, and EXT2 file system support, as well as Classic and GPT Partition Style support and is even makes it backward and forward compatible. Supports JBod (RAID 0), Stripe (RAID 0), Mirror (RAID 1), RAID 5, and RAID 0+1 (RAID 10) Array types. Supports files system both forward and backward compatible from Windows 2000 to Windows 2008. 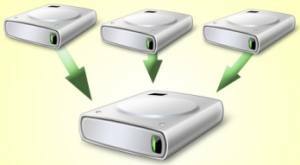 You can also recover deleted data from your HDD using Raid 2 Raid, by opening the tool and selecting the drive from where you want to recover data, and select the files that you want to recover and select the backup destination location for storing the recovered data. Similar Post MAC OSX Like Desktop Icons Stack For Windows OS.